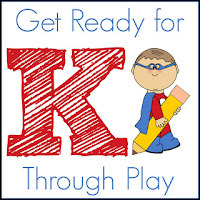 This week for the Get Ready for K Through Play Series we are talking about math concepts. Since it is summer and it is HOT where we are, we are heading to the pool for some simple math activities to get ready for kindergarten. 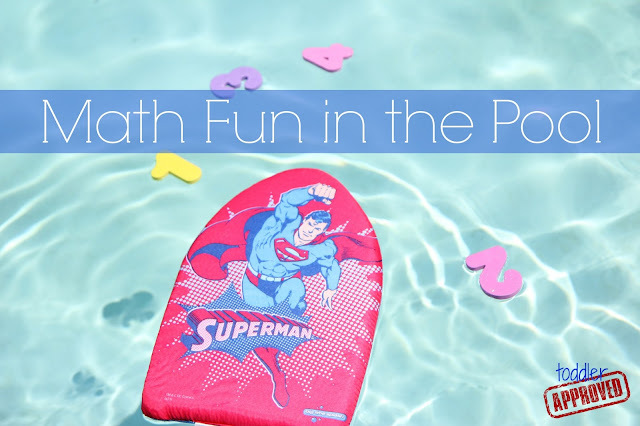 In this post we are going to share how we practiced simple counting and number skills while we played in the pool! 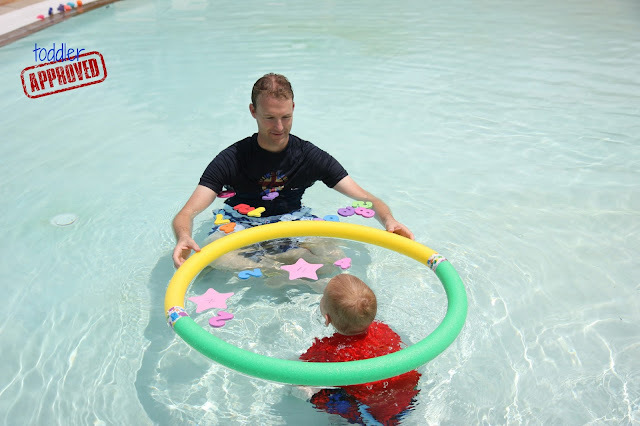 For this activity first make a giant foam noodle hoop by attaching the two noodles with duct tape. 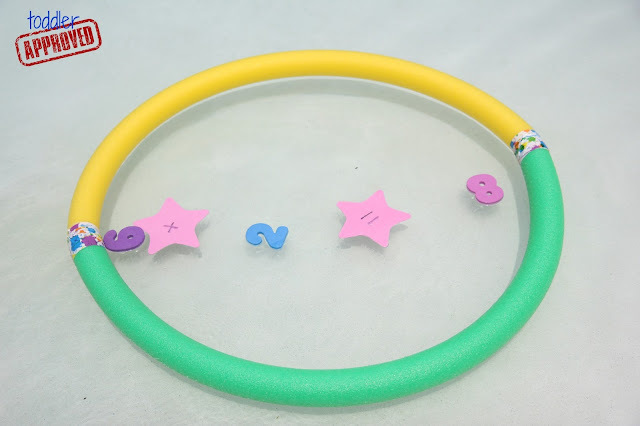 Next, toss all of your foam numbers inside the hoop. Close your eyes and grab one number. Say the number aloud and then throw it back in the hoop. Once you know all the single digit numbers, practice making double digit numbers by grabbing TWO numbers with your eyes closed. Hold them together and say the number! For example, if you grab 2 and 4 then you say 24! This is a simple counting UP activity! Just grab numbers 0-9 and practice throwing them into the hoop... IN ORDER from 0-9. To make this more difficult, grab a small foam shape or plastic ball and write harder numbers on each foam shape/ball. Toss them inside the hoop in order too! 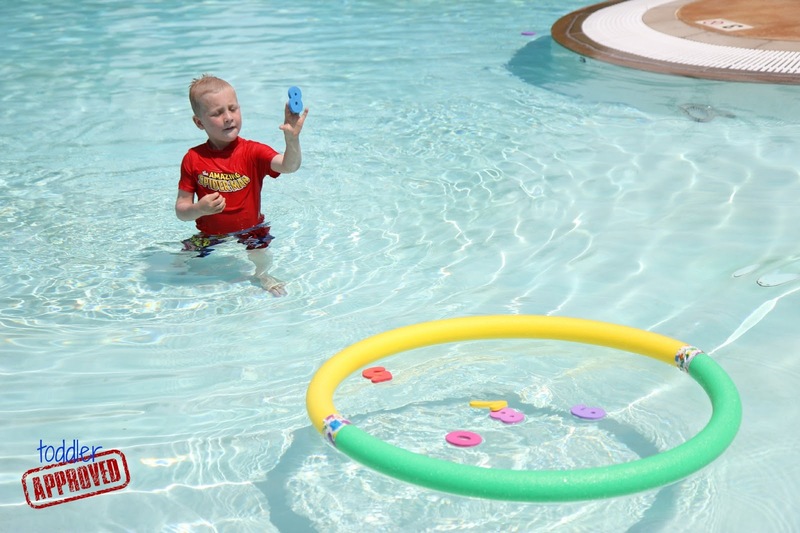 For example, grab several plastic pool toy balls and write numbers 20-30 on them... and then toss them into the hoop in order 20, 21, 22, 23,.... Or you can just practice saying the names of the double digit numbers while tossing them in the hoop in random order! The main goal of these activities is to have fun... so adjust and adapt these so that your child is having fun while also exploring numbers and practicing counting! Have kids spread the foam numbers all over the pool. 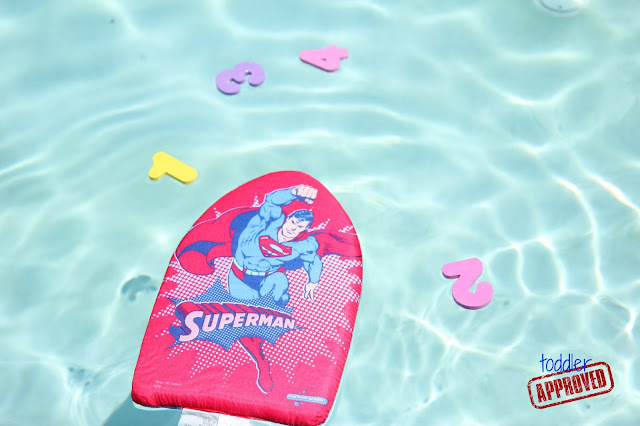 Then grab a kickboard and go and find them! You can find them in sequential order or even find them in backwards order! Or have one kid hide them and another one find them. Hunts are our favorite activities and doing them in the pool is cool too. *After a little bit my kids nixed the kickboard and just had fun practicing swimming to the numbers which was perfect since we love finding fun ways to practice their strokes as well! Write +/-/= signs on a large foam shape. Then put all your foam numbers on the outside of the hoop and pick two numbers with your eyes closed. Make a simple addition or subtraction number sentence using the foam numbers and the large foam +/-/= shapes. Then add/subtract the numbers together and find the sum and add it inside your hoop! My son and husband had fun doing this activity together. They started with simple single digit addition number sentences like 2+2= and then moved to double/single digit number sentences like 14+2= or 25+6= They practiced "counting up" starting with the big number and then counting up using their fingers to add the other numbers onto the number sentence. Our last activity involved skip counting by 10s to 100. 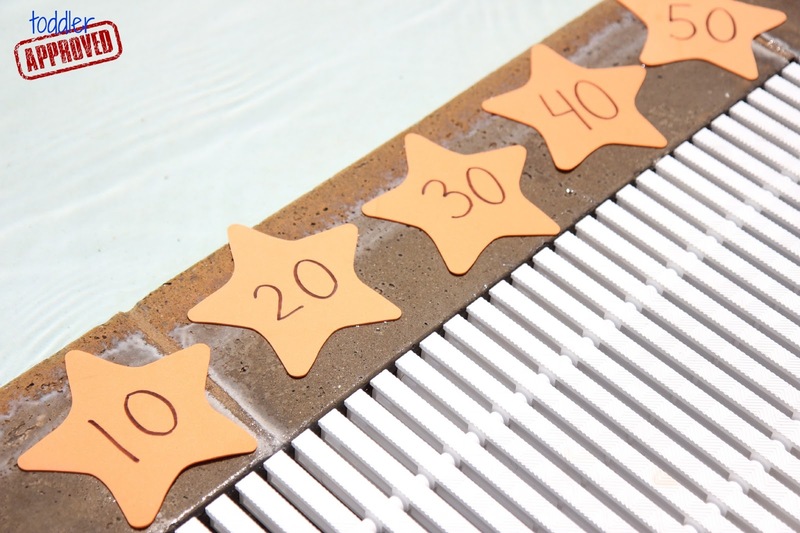 We used foam stars with numbers 10-100. We tossed the stars all over the pool and then my son got to swim to find them and put them in number order. He learned a skip counting by 10s song watching one of the LeapFrop Math videos, so he just sang along while he swam and collected the numbers in order. We had so much fun embedding some math play into our water activities this week! 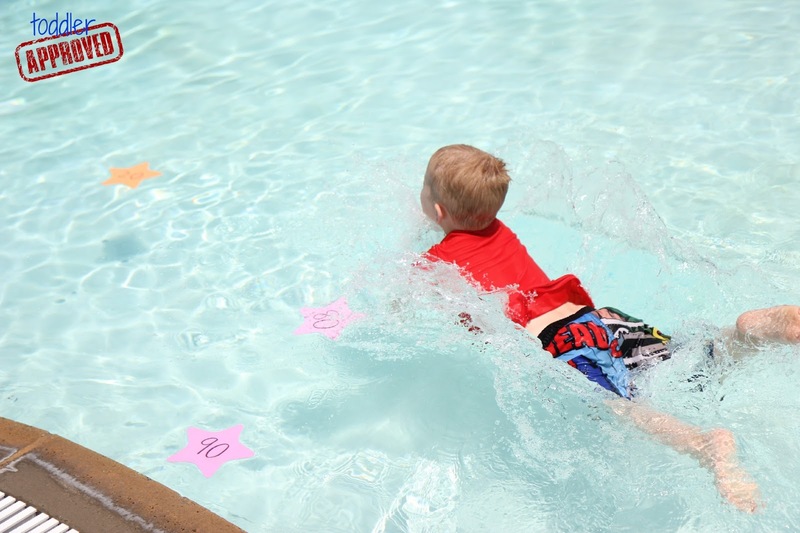 Check back for even more water play activities next week since that is our theme for Virtual Book Club Summer Camp! 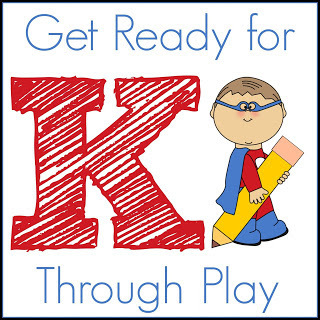 This post is part 4 of an 8 week series being hosted on 6 blogs to help kids Get Ready for K Through Play! Cool post. This is a great way to get the kids out and active while still learning. Thanks for sharing.